Preheat oven to 350 degrees. Dredge ribs in cocoa powder and espresso powder mixture, knocking off excess. Heat bacon fat in a 6-quart heavy ovenproof Dutch oven over moderately high heat until hot but not smoking and brown short ribs in batches (in a single layer without crowding). Transfer short ribs as browned with tongs to a large plate. Pour off all but about 2 tablespoons bacon fat remaining in Dutch oven and in it cook garlic, onions, carrots, and rosemary, with salt and pepper to taste, over moderate heat, stirring, until browned lightly. Add broth and chiles to vegetable mixture and bring to a boil, stirring. Return ribs to Dutch oven, squeezing them to fit in a single layer, if possible, and cover with a snug lid. Braise ribs in oven until tender, about 2 hours. Transfer ribs with tongs to a platter and keep warm. Pour cooking liquid through a fine sieve set over a saucepan, discarding solids, and skim fat. Boil liquid to thicken it slightly, add a few knobs of butter if desired and adjust seasonings. On a warm, deep platter spoon Fontina-Laced Grits on the bottom, arrange short ribs on top of grits, and spoon sauce over ribs. Garnish with fresh rosemary. Serve immediately. Bring milk, salt, and 2 1/2 cups water to a boil in a large saucepan over medium-high heat. Gradually whisk in grits until smooth. Reduce heat to low, cover, and cook, whisking occasionally, until creamy but with texture, 20 to 25 minutes. Remove from heat and whisk in butter and cheese; season with salt and pepper and garnish with chives. 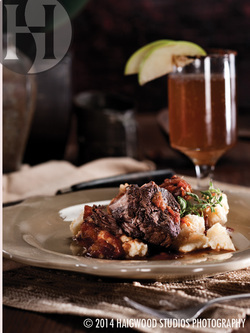 Serve by themselves or with Espresso and Cocoa Braised Short Ribs. In a saucer, mix chile powder and sugar. In a cocktail shaker, add all liquids and shake vigorously. With the cut lime, coat the rim of each glass (preferably margarita or martini glass) and roll the glass lip in the saucer with the sugar and chile powder. Strain shaken concoction into the glasses and garnish with apple slices. *Manzana means “apple” in Spanish, hence the name.